Femulate: Why are you looking at me? 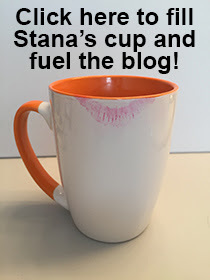 Just wanted to thank you Stana for elaborating on my suggestion. Like you, I'm not good are reading minds, an quite frankly I'm frustrated that I try. As after all, shouldn't I just be free to go about my day being who I am with out question. "Well ya!" but we both know that we are not. Perhaps that's where the secret lies. I know that I have practiced being me on most of my outings femulating, but I've added a new aunce being out masculating or is that emasculating the image people see when I am in the guise of a man. Not that I'm flamboyant, but I've let the guy guard down. It's been fun, and I've got my princess sister in-law knowing or at least speculating verbally that I am the "queen" in the family. And I have to shamelessly admit that it feels really good! I am a very feminine male - always have been - and that is probably why folks who know me in boy mode are not surprised when I switch to girl mode. BTW, I love your photo, it's very much not what we normally see you in, and you very much look very relaxed! Thank-you, Joan. It is an old photo (from 2004). If that's a new wig its a great one! Probably one of my favorites! Joanna, it is an old wig in an old photo (from 2004). I love your photo, very lady like. You are a very stunning woman. The more relaxed and comfortable we are when we are out and about the more we blend in. As a therapist said to me a couple of weeks ago, "I wouldn't have know from looking at you, if you hadn't said anything. There are some I meet that I can tell right off, some that raise questions, but you I never would have guessed. You are a very beautiful, well dressed, poised, and confident woman." When you are out: relax, smile, maintain positive thoughts, go with the flow, and try not to say anything to people about being a transwoman (because most are accepting your presentation); there will always be someone who looks at us funny, that doesn't mean that they suspect anything, so the confidence we have about who we are and how we are dressed the less we will be read. I have seen women that caused me to wonder what they where thinking when they got dressed before heading out and other that I just couldn't help but compliment them on something they were wearing. Liza, all good points and I'll add a nuance to them, "when you are comfortable with who you are and you bring that comfort into the world while you femulate, you make those around you comfortable? I've mentioned before: if I could have one "superpower" it would be to read the mind of people when they first met me. That superpower could be a good thing or a bad thing! Sometimes, it is better not to know. As they say, "ignorance is bliss."